Last week we had a first RAMPUP player here and this week another one showed up on the front door. Plus the team as whole is doing very well in Challenger Cup, where they sat on the first place of Crowd Favourite leaderboard last time I checked. 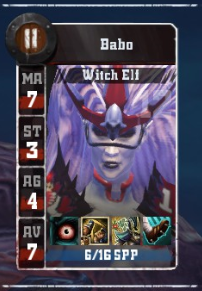 And Babo helped in that matter in the last game as well, when she surfed one Saurus into the crowd. And as most of the women she had to interfere everywhere. She scored one of the 2 touchdowns, made a pass and a catch. In 8 blocks she broke armor only twice but one of them hurt the Lizardmen on the most sensitive place. She killed "Thanos is your Daddy", the Kroxigor, and will have a new leather boots to show for the next game. Bash'Fagor knew he was different since he was a little kid. The sight of blood made him unneasy and the prospect of growing claw made him woke up at night in cold sweat. As a teenager he found liking in David Bowie hairstyle and having top notch manicure. He found out what is "wrong" with him after his parents allowed him on the internet and he found PROELFHUB. He felt like he found his calling immediatelly. After some searching he decided to join SJCW (Social Justice Chaos Warrior) group and eventually came ouf of the closet when he decided to join group of similarly thinking individuals and started a blood bowl team. He joined only under the condition that he will not be forced to hit stuff. At the same time he changed his name to elfish Idhrenmaedhdraug MTL. 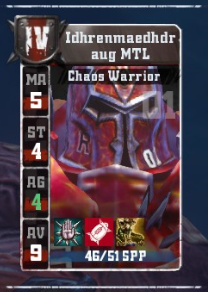 And that is a story about how this Chaos Warrior with agility stat up and Leap only made one block in a game, but mindboogling 6 passes. Scoring was not on the table and the team lost. But Razta got a player into Player Team Of The Week after I teased him in previous article and that is all that matters. I like this very much. Once Cat got a whiff of Dirty Claws getting in the Player Team Of The Week last week, she growled and the ChaosDwarfs knew the trouble is coming. 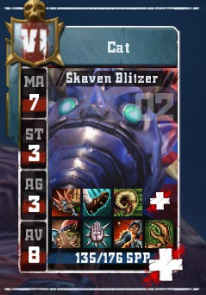 Turn 1 blitz and Claw, Guard Blocker was a history. For a moment until the apothecary saved him. Can you believe it? The same could not be said about Mighty Blow, Guard, Stand Firm, Dauntless Blocker who was dead before he hit the ground. Not even Piling On was required. She added 2 more badly hurts and 2 knock outs later. All that in 14 blocks and 11 armor breaks. After her team won 2-0 she was finally satified and returned to purring. Until next game. This may be the first Brettonian Blocker that I have seen here in the last 2 seasons. Most of the times it is their teammates Blitzers that reap all the glory. But when I took a look at him it was immediately clear why he made it. Mighty Blow, Piling On, Tackle and Block destines him to be the undoer of the blood bowl players and undone them he did. In the last game 3 of his opponents left with first row tickets to cemetery. First to leave was just a goblin in turn 1, but then in turn 8 the Kingslayerzs's Stormvermin died by his hand and appothecary did the ussual trick where it is totaly useless. Then in turn 9 he dispatched off their Thrower too. He was not done yet though. By the time the game ended another goblin suffered an agility bust and a linerat was forced to take a week off due to Archer. Last week I went on a little trip down the memory lane when I mentioned the most famous REBBL Vampire Your Boss (✞2018). While Bloodsuckers Inc. is having hell of a season, they have not featured any vampire here so far. 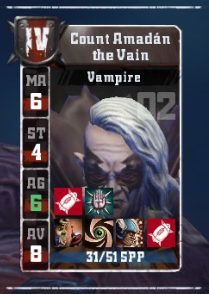 The 2nd Vampire to be featured here is Count Amadán the Vain from the fresh Who Bat team. I am not sure if the thralls of that team are radioactive, but bitting them and sucking their blood worked wonders on Count Amadán. His first 2 level ups were Agility stat ups. He will not only hypno gaze his opponents down on 2+, but eventually leap into cages, steal the ball and dodge out to safety. For now he only has Block to make him survive. But he clearly did not need it in the last game. 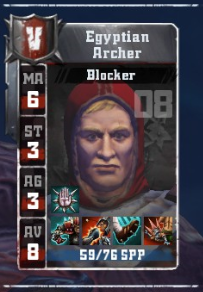 He broke armor 4 times in 3 blocks. I was scratching my head there for the moment, as he does not have Piling On and no matter how hard you gaze it is not gonna break the armor. But he clearly gets armor breaks for bitting too. He utilized his agility by doing 2 passes and 3 catches. The rats were not paying attention to the sidelines as he was able to surf 2 of them as well. Him scoring one touchdown did not prevent his team to lose the game, and the team is on the tail of the division but I am sure with AGI6 vampire there will be lots of fun in their future games.